King Mswati III, the absolute monarch of Swaziland / eSwatini, is preparing for another lavish birthday celebration despite the poverty that ravages his kingdom. In past years the equivalent of many millions of US dollars has been spent on his celebrations, much of it from public funds. It was reported locally that officers of His Majesty’s Correctional Services (HMCS) which deals with prisons objected to being made to donate from their salaries towards the cost of the King’s birthday celebration this year. King Mswati is Commissioner General-In-Chief of HMCS. The King’s birthday falls on 19 April but this year that coincides with Good Friday so he has put back his own celebrations to 26 April 2019. A public holiday for that day has already been declared. The venue for the celebration will be the Buhleni Royal Residence in the Hhohho region. The King has at least 13 palaces across Swaziland, a kingdom about the size of the US state of New Jersey. Full details of the celebration have not yet been announced. Last year for his 50th birthday the Queen Mother gave King Mswati III a dining room suite made of gold. The Government, whose members are personally appointed by King Mswati, gave him a lounge suite trimmed with gold. He also received cheques totalling at least E15 million (US$1.2 million) to help pay for his birthday celebration that took place on 19 April 2018. On that day he wore a watch worth US$1.6 million and a suit weighing 6 kg studded with diamonds. Days earlier he had taken delivery of his second private jet. This one, an Airbus A340, cost US$13.2 to purchase but with VIP upgrades was estimated to have cost US$30 million. This happened at a time when seven in ten of the estimated 1.1 million population lived in abject poverty with incomes less than the equivalent of US$2 per day. The global charity Oxfam named Swaziland as the most unequal country in the world in a report that detailed the differences in countries between the top most earners and those at the bottom. 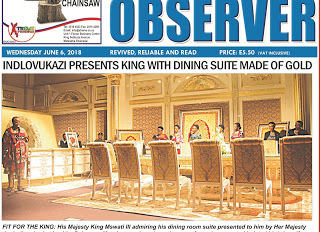 The Swazi Observer, a newspaper in effect owned by the King, reported at the time that many of the King’s subjects visited him at Lozitha Palace to hand over gifts. It reported that this took six hours to complete. In 2017, just as the World Food Program (WFP) revealed that one-in-three people in Swaziland were ‘in need of emergency food assistance’, media in the kingdom reported that King Mswati III’s birthday cake took three months to prepare. In 2015, King Mswati hosted a birthday party for himself that cost at least E1.2 million (US$120,000). According to a report in the Sunday Observer, 35 cattle and 1,000 blankets were also presented to the King. The King’s subjects, through their chiefs, also contributed 69 cattle, two goats and E5,400 cash. In a speech, the King told his admirers that God blessed his party.